At the Ordinary Congress of The Baseball Federation of Asia (BFA) held in Seoul, Korea on Nov. 4, 2011, Toshikazu Sakakibara (77), Board Member of All-Japan University Baseball Association, was presented 2011 BFA Presidential Award for his contribution to development of baseball in Asia over the years. He is instrumental for the development of baseball particularly in Thailand where he has been continuously involved for years since before the establishment of the current Thailand Amateur Baseball Association. His contributions include sending coaches, inviting players to Japan and amongst all the funding and promotion of baseball in Thailand. 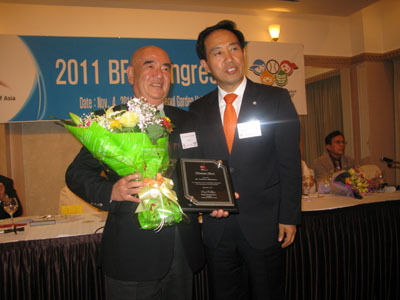 Yoshinobu Suzuki, Vice President of BFA and BFJ, received the Award from BFA President Kang on behalf of Sakakibara. The 4 other recipients of the Awards are Mr. Hector C. Navasero (Philippines), Mr.Khawar Shah (Pakistan), Mr. Laurence Lee (Hong Kong), and Mr. Tom C. H. Peng (Chinese Taipei).